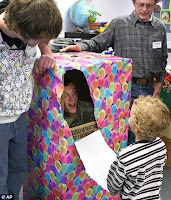 Home » Best 6-Year Old Birthday Present: Dad Home From Iraq In A Box! Gabriel Hurles will never forget his 6th birthday. While celebrating the big occasion with his friends, the lucky little boy peeled back the wrapping paper on a big box to find the surprise of his young life. Army mechanic Casey Hurles, 23, who was hiding inside the box, hadn’t seen his son since he left in June. When he learned his leave would coincide with his son’s birthday, he hatched a plan to hide out in the big box. ‘It was such a rush of emotion,’ said Hurles, who said he got butterflies in his stomach while waiting in the box. That is awesome.I would love to do that present.